Ruby is a peanut in size! The miniest American Pit Bull Terrier mix we have ever seen! She maybe weighs 30 lbs. Ruby is about 4-5 years old. She does well with dogs similar to her size or larger (no smalls), and play-style which is moderate to tumbly. We love this heart-shaped face & you will too. She is spayed, vaccinated, heartworm negative & microchipped. She is available at Dogs by Debin in KCMO. Interested? Please visit http\://bit.ly/1m78fU5 to complete our quick online adoption application from your computer or desktop (not a phone). 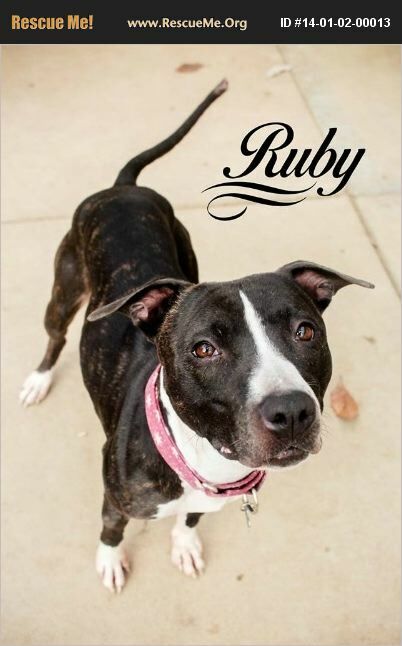 Ruby's adoption fee is $175 & includes: Spay, vaccines, microchip, deworming, a heartworm test, & an offer of pet healthcare insurance for 30-days from adoption date. Thank you!